ValguLoc provides excellent bunion relief while you sleep. Slip on at nighttime and experience remarkable relief from the pain and nagging discomfort of bunions. While you sleep tight tendons and muscles stretch giving you comfort and relief. It relieves bunion pressure and provides superior support that won't slip or move about. The plastic brace secures your toe in place, while soft foam surrounds the tender area. Adjust the pad to provide the most protection where needed and secure in place with the Velcro strap. 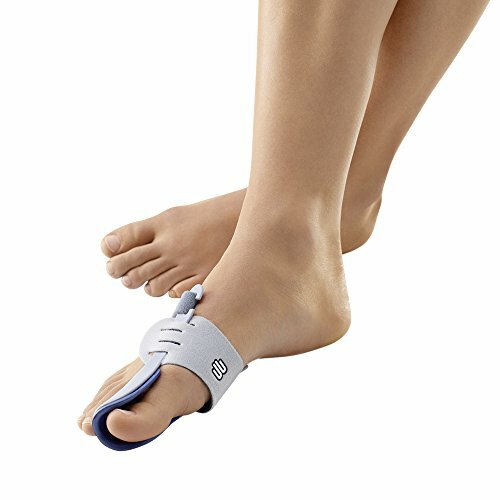 The ValguLoc postural splint is suitable for the correction of a misalignment of the big toe (hallux valgus, bunion) as part of a conservative treatment or after surgery. The anatomically contoured orthotic holds the toe in the correct axis by applying a slight force and stretches shortened parts of the capsule and soft tissues. It is worn only without shoes.